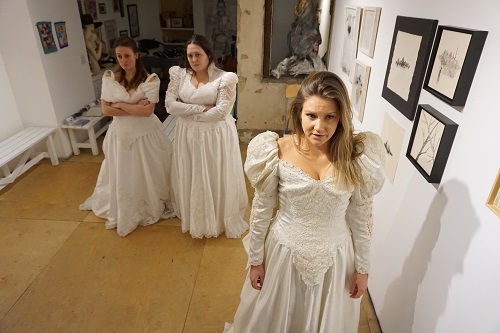 The intimacy of the Gerrard Art Space is a fun and symbolic setting for The Drowning Girls (Mortar and Pestle Productions), which tells the story of three women who were murdered by early 20th Century serial killer and bigamist George Joseph Smith. All three women were seduced into a whirlwind romance and hasty marriage with Smith, who assumed a different alias each time. All three women were persuaded to take out a sizeable life insurance policy shortly before their deaths. All three women were drowned in their bathtub. George Joseph Smith’s case led to breakthroughs in forensic pathology and he has been the subject of a great deal of psychoanalysis over the last century. This story focuses on the inner life of the women. Why did they fall in love with this man so fast? Why weren’t they suspicious when he began swindling them of their savings and insisting that they take out life insurance? What went through their minds in the moment before their deaths when they saw the monster? The prize-winning 2010 Canadian play by Beth Graham, Charlie Tomlinson and Daniela Vlaskalic does a very good job of bringing Alice Burnham, Beatrice “Bessie” Munday and Margaret Elizabeth Lofty to life from the annals of criminology. The story reflects on social beliefs about love, belonging and how women are valued that are quite timeless. Riley Anne (Alice ), Danielle LeBlanc (Bessie) and Melissa Beveridge (Margaret) demonstrates a superb understanding of each woman’s backstory and motivations, and they tell the naked truth of who they were. The results, each woman is realized with humanity and compassion, without any of the victim blaming that is a risk of this tale. The piece works well with no-nonsense sets and straightforward costuming. All three brides wear their wedding gowns. Their set is three pine bathtubs doubling as coffins. The performers emerge from the pine “bathtubs” wet and blue lipped, and continue to re-enter and exit their coffins at key moments in the narrative, symbolically immersing their faces in water each time. The story needs no other accouterments. There is an enigmatic charm to seeing independent theatre in an intimate venue. I enjoyed both the play and the atmosphere. There’s an excellent exhibit of local artists’ work on display at Gerrard Art Space. My eyes were drawn to a series relying heavily on textile media, and one innovative wall hanging series using pig intestine as a medium. All in all, The Drowning Girls is a fine night of independent art and performance in the East End. The Drowning Girls is playing until February 3, 2018 at Gerrard Art Space (1475 Gerrard Street East, Toronto, Ontario). Show times are 8:00 PM on January 25-27 and February 1-3, with an additional matinee at 2 PM on January 27. Ticket prices range from $15 – $20. $15 for early-bird purchases online or $20 at the door. Tickets are available online, or at the door.